Everyone who is ever involved in any sport, dreams of taking part in the Olympic Games. This is every athlete's ultimate goal. 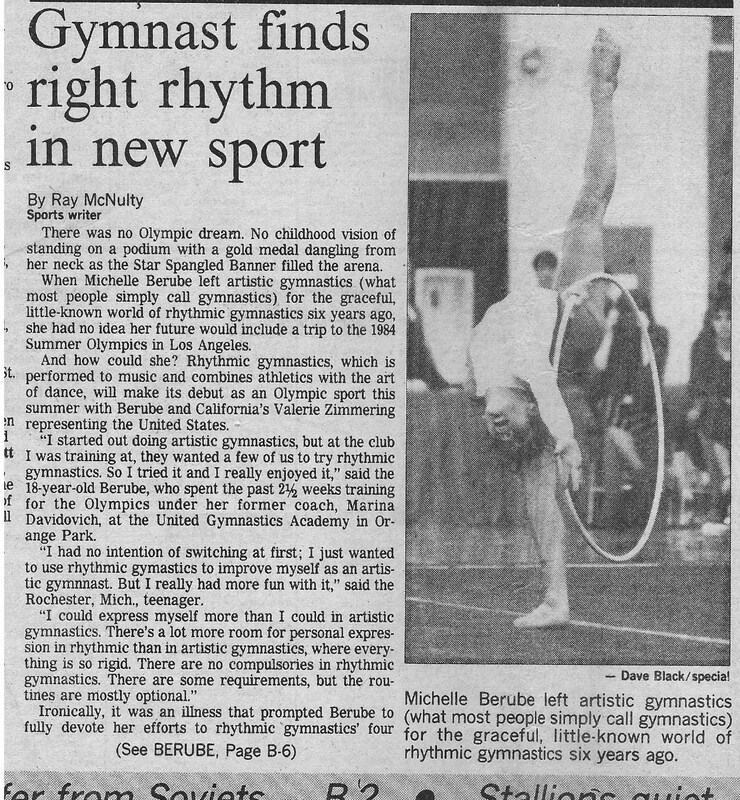 Since all my life I was involved in the sport of Rhythmic Gymnastics, and this sport was not part of the Olympic Games program, I can't tell you how excited we all were when the decision was made that Rhythmic Gymnastics FINALLY will be part of the Olympics as of 1984. Competitive rhythmic gymnastics began in the 1940s in the Soviet Union. The FIG ( Federation of International Gymnastics) formally recognized this discipline in 1961, first as modern gymnastics, then as rhythmic sportive gymnastics, and finally as rhythmic gymnastics. The first World Championships for individual rhythmic gymnasts was held in 1963 in Budapest. Groups were introduced at the same level in 1967 in Copenhagen, Denmark. 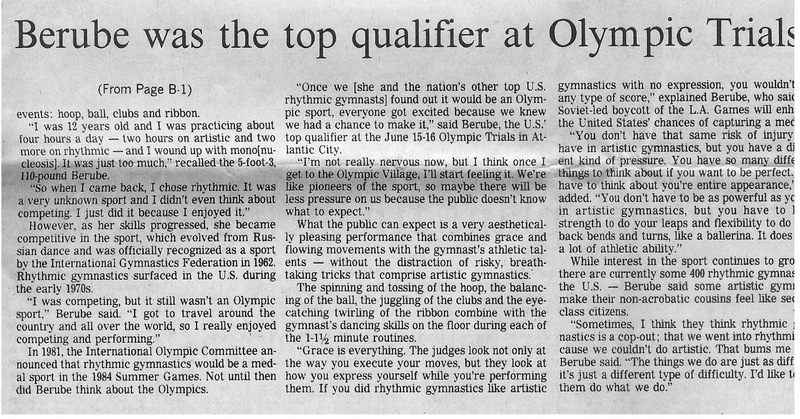 Rhythmic gymnastics was added to the 1984 Summer Olympics in Los Angeles, with an Individual All-Around competition. However, many federations from the Eastern European countries were forced to boycott by the Soviet Union. Canadian Lori Fung was the first rhythmic gymnast to earn an Olympic gold medal. In 1984 we just moved from a small 3,000 square foot facility in the Industrial Court in Orange Park, Florida to a large (our own!!!) 10,000 sq. ft facility. We had 2 gymnastics floors and one of the gymnastics floors was dedicated to Rhythmic Gymnastics. I already had a very strong team: Kerrie Jackson, 13 year old was a member of the Junior National Team. Around May of 1984 I received a phone call from Michelle Berube, actually her Mother Kathy. Michelle was one of my students that I coached while we lived and worked in Detroit. She was one of my most talented girls: strong, flexible, expressive, aggressive, determined and very beautiful. During the 1984 National Championships Michelle was one of the two girls who qualified for 1984 Olympic Games. She asked if she could come to Jacksonville and train with me in order to prepare for the competition. It was a very important decision. By agreeing, I assumed a role of an Olympic Coach. It's a lot of responsibilities. My baby Joanna was only 8 months old, our business was fast growing and my presence was necessary. But who can say "No" to the Olympic Games??? Not me! So Michelle moved to Jacksonville. She lived with us and we trained every day 4-5 hours a day. Everything was going very well. Routines were challenging, difficult and original. Michelle was getting strong, consistent and confident! We were planning to travel to Los Angeles together. 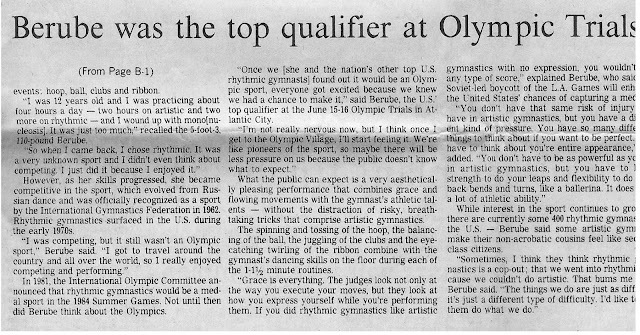 But right before we were ready to leave, I received a phone call from the US Gymnastics Federation informing me that there is going to be only one coach representing the US on the Olympic Games and it's going to be Alla Svirsky, coach from Los Angeles. So, I could not go...I was heartbroken, Michelle was very upset, but I told her that Alla is a very good and experienced coach and she will be in good hands. And all Michelle needs is confidence and positive attitude! I did my job. Michelle was ready! So in July 1984, Michelle left for Los Angeles. My heart, my thoughts and my spirit was with her. I was so proud of her!!! 1932... A milestone in Jewish sports history. The vision of a world-wide sporting event becomes a reality. A total of 350 courageous athletes traveled to Palestine for the first Maccabiah Games. Twelve Americans journeyed across the ocean to represent the United States in this landmark athletic event. 1985...Another milestone in Jewish Sports history. Participation has grown to over 4,000 athletes who represented 4-0 Nations. What commonly known as "Jewish Olympics" has become the pinnacle of amateur athletic competition among Jews, who gather in Israel every 4 years from the far reaches of the World. 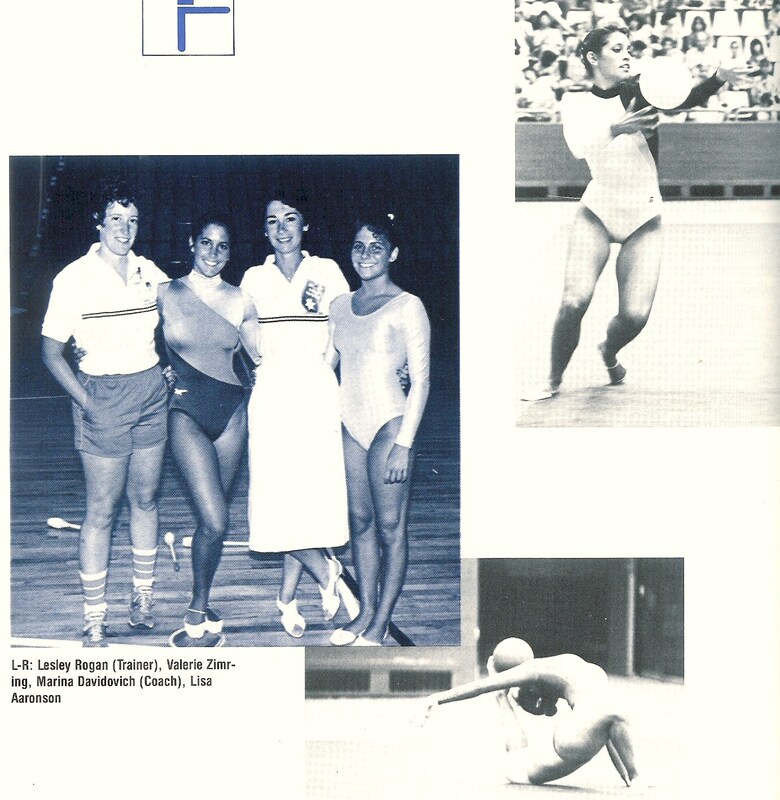 I was so proud to be a Rhythmic Gymnastics Coach to represent the US at the 12th Maccabiah Games! On July 8th we all got together at the Rutgers University campus, located in New Jersey for a 3 day preparation camp "Pre-camp". This was the initial gathering of the entire US 12th Maccabiah Games contingent, over 1,000 people. It was so fascinating to meet athletes from all over of the United States in all the different sports. It provided the opportunity for athletes to meet their teammates and coaches prior to departure. It was imperative to disseminate information about the procedures, schedules and events in Israel. We had lectures, we were shown movies, given literature about Israel and the Games, evening entertainment, uniform alteration and of course information on safety. On July 10th, a 10-bus caravan rolled out of the Rutgers campus for JFK Airport. The surge of energy radiating from each member of the US delegation was unmeasurable! The ten hour flight to Israel passed swiftly with the buzzing of conversation,card games, walkmans, naps, and even hot bagels. At last the sign flashed "fasten your seat belts"... We were landing in Israel! Clad in red, white and blue Adidas warm-ups, the American delegation promenaded down the gateway to the cheers of the Israeli media. Once through the customs and luggage collection, we all boarded buses to different accommodation centers. We stayed at the Wingate Institute, not too far from Tel Aviv. Our accommodations were very much military style. Small beds, tiny bedside table and few chairs. But everything was very clean and orderly. We woke up at 7am for breakfast at the big cafeteria: hard boiled eggs, bread, tomatoes and cucumbers. Training at 8am. Free time until 3pm.Training again at 4pm. Dinners were wonderful: delicious food, loud and happy people, singing and dancing afterwards. We did have military protection at all times. Soldiers with rifles on the roofs, in the hallways, on the buses. It was so strange at first, but after few days it was part of our lives. The opening ceremony, July 15, 1985 was a celebration of pomp and pageantry that will be everlasting in my memory. Ramat Gan Stadium overflowed with 55,000 zealous spectators and over 4,000 Jewish participants from 40 Nations. All were united by a love of sport and a common heritage. Barriers of language, culture, age melted under the stadium lights. Mark Spitz, 2-time Maccabiah participant was the first non-Israeli to light up the torch symbolizing the commencement of the Games. Our competition was held in the Sports Center in Tel Aviv. Girls did an outstanding job, taking Gold medals All Around and in individual events. I will treasure every moment of these 2 weeks for the rest of my life!